Once again, I decided to venture into the real world to cover a live event, the occasion being a Pittsburgh Steeler charity basketball game. If you'll remember, I also attended one of these last year, at Monessen High School, and it was a pretty neat experience, if for no other reason than to get an idea of how Najeh Davenport's athleticism would translate to another sport. So last week, I again took a drive to Monessen, PA, to catch this year's edition of the game. As usual, you have no idea what to expect when you attend one of these games. Rarely do the Steelers tip their hand at who will be playing for their team on a given night. Everyone from Ben Roethlisberger to James Harrison has suited up in the past, but it's pretty much a total crapshoot. 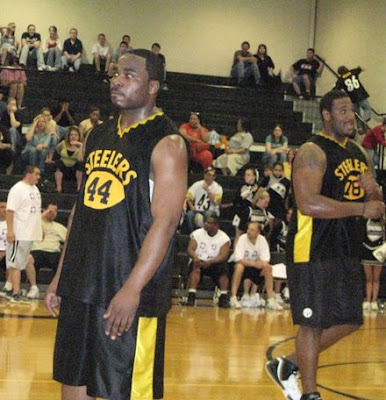 Last year, the Steelers sent just six representatives to the Monessen game: Davenport, Max Starks, Anthony Madison, Arnold Harrison, and practice-squadders Jon Dekker and Gerran Walker. It was certainly charitable of those men to show up, but it was lacking the star power you think of when you hear the words "Pittsburgh Steelers". I know, I'm complaining about star power in a charity game. I'm a horrible person. Although I must admit, when Dekker got arrested right before the Super Bowl, I knew who he was because of this game. (And by the way, he was acquitted, so all's well that ends well). This year, I was overwhelmed by a much-improved lineup: Super Bowl MVP Santonio Holmes and local boy Charlie Batch were greeted with overwhelming approval by the crowd; the team was rounded out by a host of offensive linemen, including Trai Essex, Darnell Stapleton, Starks, and Willie Colon, plus Carey Davis, Ryan Mundy and Madison. If nothing else, these guys could form a wall around Batch and let him shoot threes as an offensive strategy. But that would be too easy. On this evening, the Steelers would be facing a mix of Monessen faculty members and a few select local athletes. Headliners included former Philadelphia Eagle Jamie Reader, Cal U Vulcans sophomore Kelsey Williams (very impressive athlete, by the way), and the WNBA's Charel Allen, a Monessen grad. From the opening tip, which Starks won with ease, it was obvious that the Steelers would have a game on their hands. They take basketball very seriously in Monessen, as those roughly 900 PIAA, WPIAL, and conference championship banners would confirm. 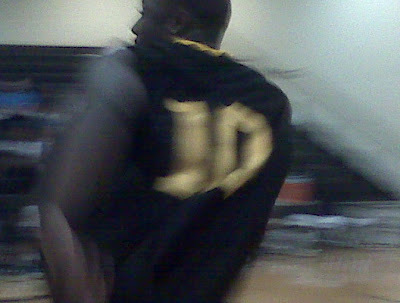 Minutes in, and I get a Santonio close-up at my half-court seat. Much like the Super Bowl, he also kept his feet in bounds on this play. Play was about as intense as you could expect for a bunch of pro athletes that don't want to get hurt and a random collection of teachers with a few ringers sprinkled in. Offensively, the Steelers were certainly liberal with the three-point attempts. Was this a strategy devised by Bruce Arians? We make it to halftime, and you know what that means: free autographs, the two favorite words in the American vocabulary. Lines formed quickly, although Santonio would probably still be signing without the aid of a clock that limited the duration of the signing session. For as chaotic as such an opportunity could be, it was actually a well-controlled halftime. Nearly every kid who wanted an autograph got one, with the exception of a few who were shut out on Santonio. But make no doubt about it, the young people in attendance were thrilled with their brushes with greatness. Everyone found their seats, play resumed, and it was tight. The Steelers' collective sphincters were shrinking. Was there a chance that a group of pro athletes could drop a game to a group of (mostly) amateurs? We entered the final minute of play, and the game is neck-and-neck. At this point, I pulled out the old Blackberry and tried to capture some video (albeit grainy) of the last few seconds. If I can set up this clip: tie game, crowd is going absolutely bonkers. To imply that this had any more importance than it actually had would be ridiculous, but from the atmosphere, you would think it was the last 30 seconds of a Final Four game. Monessen takes possession, goes the length of the floor, and misses a shot. The Steelers grab the rebound and score a quick basket, taking a two-point lead. One problem: much like in the Super Bowl, they scored too fast and left too much time on the clock. Cal's Kelsey Williams subsequently drives in for the game-tying basket, the final buzzer sounds, and the place absolutely erupts. Unfortunately, they ended the game in a tie. 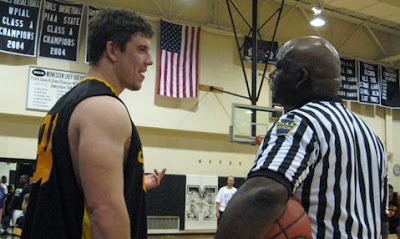 But as charity basketball games involving NFL players go, this would have to rank as an "Instant Classic" nonetheless. The Steeler hoop squad has a few games coming up soon, including this Wednesday the 29th at Ringgold HS (8 PM) and at Upper St. Clair HS on May 1st at 7 PM. If you're in the area and have a few hours, stop by. You might just see a Super Bowl MVP. And you'll be helping a good cause. that is the loudest youtube video ever!